Meet Angela. 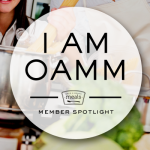 She is a OAMM Member and test cook! Hear how freezer cooking helps this busy working momma save time and money. Meet OAMM staff member, Marisa. She homeschools 4 children while working from home, and freezer cooking gives her much needed margin in her day. Meet OAMM staff member, Kim. She’s a work at home and homeschool mom who freezer cooks to stay sane. And she has an awesome sneak peak to share with you. Meet OAMM staff member, Stephanie! She freezer cooks to feed her family of 5 healthy, real food and to give her time to teach yoga. Meet OAMM Member Joanna. She is a veteran freezer cook, but since learning how autism impacts her family it has become an even more important part of her routine. OAMM Member, Toni. She is a busy homeschooling mom who has found freezer cooking saves her many hours shopping and cooking and keeps family from eating out. We met OAMM member Dan when he took part in our first virtual cooking day. We invited him to share a little more about how he uses OAMM as a single guy. OAMM member Beverly cut out processed food and streamlined her cooking process using freezer cooking so that cooking didn’t take up every weekend. 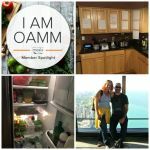 OAMM member Matt and his wife Jenee both work full time, but freezer cooking together one weekend a month gives them back their evenings with their son. Meet OAMM member Lea. She freezer cooks to avoid allergens and food preservatives, but it is also a huge time saver for her large family. OAMM member Ellisa tried our free mini menu and was hooked! She loves combining the Whole Foods, Paleo, and GFDF to provide her family with wholesome meals. OAMM Member Robin gave our free Mini Menu a try and now she is hooked on freezer cooking! Her pro membership makes searching for kosher recipes super easy. 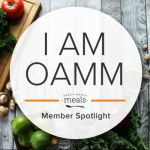 Meet Laura, an OAMM member who shared that she uses freezer cooking so that she can have healthy meals despite severe physical limitations due to illness. 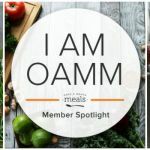 Meet OAMM member Jill. She cooks once a month so that she can enjoy extra time with her 5 children and still eat healthy and clean meals.